Abusing the Tracking Software or Smart Job Hunting Tactic? A question I proposed on LinkedIn: I am starting to hear more stories about how some job seekers are copying and pasting buzzwords directly off the job description and pasting them onto their resume. Then they are changing the text color to white so that it’s naked to the human eye, but still gets picked up by the robots on the ATS. Now the job seeker can either utilize it on an “extra page” that has nothing on it and is assumed was added on upon opening the document and its compatibility software might be a little off…or the candidate can manipulate it using inserts to place visible written text over the hidden text. Either way it sounds smart to me and although might be considered dishonest, it certainly cannot be argued that it can’t help out. What are your thoughts? – Wow that’s interesting. I mean that shows that they really want the job! I am not really sure if that’s necessarily a bad thing. – The job market is really tough these days and I can understand why this is happening. I don’t know that I love the idea, but if it gets you to the hiring manager and you have the experience to back it up, this may not be a bad option. 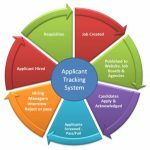 We rely so heavily on ATS’s these days that good applicants are just falling through the cracks because of missed “points” not assigned by the ATS. Until we can get back to a time where we can read each resume individually to determine a candidate’s worth, job seekers are going to continually evolve their skills for outsmarting the computer. Who knows, maybe the creativity for outsmarting the ATS makes them the best candidate of all! – Jill hit the real problem on the head: “We (recruiters) rely so heavily on ATS’s these days that good applicants are just falling through the cracks because of missed "points” not assigned by the ATS.“ As long as recruiters rely on an ATS to tell us which resumes to actually read, adding keywords to the resume will be a viable candidate strategy. Go for it! Use whatever you can to your advantage without hurting others.